By entering the Festive Season for 2017, the local SAPS would like to inform the community of their annual roadblock during this season. The roadblock commenced on Wednesday, 13 December, and will end on Tuesday, 16 January 2018, at Kempsiding. Numerous departments such as the SAPS, Traffic Department, Immigration Office, SANDF (South African National Defense Force) and the K9 unit, will join forces in conducting a thorough roadblock where all vehicles will be stopped and searched. The operation will focus on unroadworthy vehicles, unlicensed drivers and vehicles, illegal firearms, illegal immigrants, motorists driving under the influence, possession of drugs and stolen items as well as the thorough inspections of vehicles in search of stolen goods. The community of Mkhondo and surrounding areas that make use of this road on a daily basis are urged to be patient whilst waiting at the roadblock. The police members will be lenient to residents who travel on this road daily but no special treatment will be given to anyone and all vehicles will be stopped and searched. 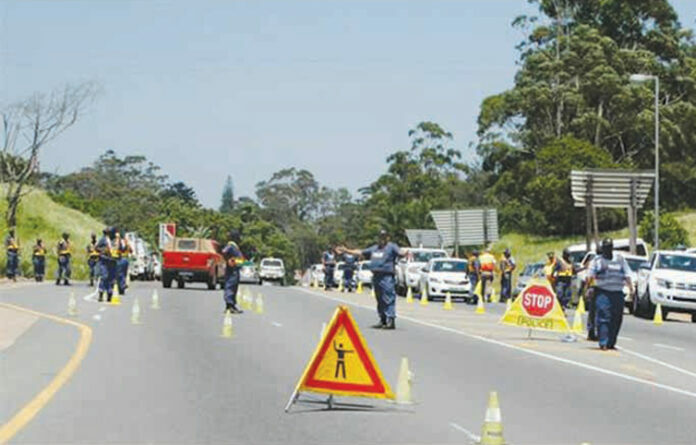 By conducting these roadblocks, criminals are kept off our streets and inconsiderate drivers who do not stay within the boundaries of the South African law will have to face the consequences. A detailed report will be provided in January 2018 once the roadblock has come to an end.